If you don't know Robotech, then... well damn, what the hell man?! Why don't you know about Robotech?! It's a freakin' awesome 80s anime series that is a combination of three separate Japanese anime series which were brought together by a visionary named Carl Macek. The three unrelated Japanese series, The Super Dimension Fortress Macross, Super Dimension Cavalry Southern Cross, and Genesis Climber MOSPEADA, form three sagas of Robotech series, Macross Saga, Masters Saga, and New Generation Saga. This DVD release contains two Robotech films, The Shadow Chronicles which was originally released on DVD in 2007, and the all new film Love Live Alive. Even though The Shadow Chronicles was made first, chronologically speaking Love Live Alive should be watched first as it summarizes the New Generation Saga including the series end, which is where The Shadow Chronicles picks up. I was so excited to hear there was going to a new Robotech movie and I when I actually got it I was very eager to pop it in that evening and watch it... so after watching it I have to say that I did enjoy it, but at the same time I was also really disappointed because it turned out to be nothing more than a 90 minute clip show. Love Live Alive takes place after the end of the Robotech series where the war is finally over. After a short narration alongside some new animation setting up the start of the New Generation saga (the Invid invasion), we fast forward to after the war were we find ex-soldier Lancer, dressed as the famous singer Yellow Dancer, talking to a reporter while preparing for the evening's concert. We don't even really get to see the reporter, we basically just get a shot of her lap holding a tape recorder. And from here, the entire movie is pretty much just clips from The New Generation Saga. It's not until the very end that we get a little bit of new animation, but by that point it hardly matters. While I enjoyed seeing a recap of the New Generation saga, I was bummed that it was just a recap, as I already own the entire series on DVD and have watched the show plenty of times so it really wasn't anything special. If you didn't grow up obsessing over this show then perhaps you'll have a better opinion that I, but then again I'd have to recommend just checking out the series rather abbreviated summary. The extras on the Love Live Alive disc consist only of a pre-production image gallery of concept art, and a Love Live Alive teaser trailer, so again there's nothing new there. I did like how they made the teaser trailer feel like the end of a Robotech episode where they tell you what's going to be in the next episode. Next up is The Shadow Chronicles. The artwork in this film is more modern and looks way better than the original series... not that the art in the original series was bad, far from it, but comparing the animation of an 80s TV show with that of a movie with feature film budget just really isn't fair. The mech in this movie are all 3D computer animation, though it blends nicely with the beautiful 2D artwork. The story starts with a summary of the Invid invasion and the final battle before the war's end, though there seems to be a slight difference in continuity between how the show actually ended and The Shadow Chronicles' version of events. It's like they wanted to tell a specific and needed to tweak events to make that happen. It's not ideal but I can live with it. The movie introduced a new race of beings... but I don't want to summarize too much as I don't want to give away any twists. I'll say that the movie is entertaining, but it felt more like an introduction to a new Robotech series rather than a self-contained movie. Although this isn't a new movie, I did enjoy seeing it again. And this disc actually has some nice extra features. There are several deleted scenes clocking in at around seven minutes total, and can be watched normally or with an audio commentary to find out why they were deleted. Then there are about three minutes worth of outtakes which unfortunately aren't really that funny and have this annoying beep they put in between each one. So, is this release worth getting? Well, if you already have The Shadow Chonicles on DVD, then no. Otherwise, I'd say maybe. 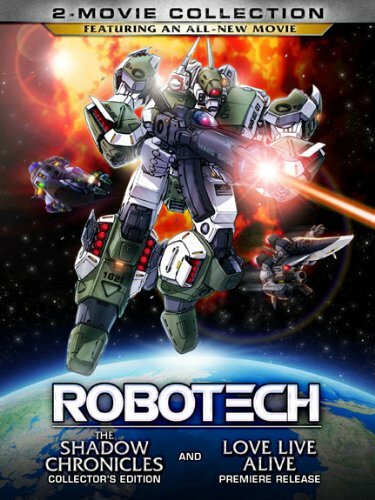 If you're a Robotech fan then you'll probably want to pick it up, but not at the full $19.98 retail price, and if you're not already a Robotech fan then I'd say start with the series, and if you really want to see this first then rent it.